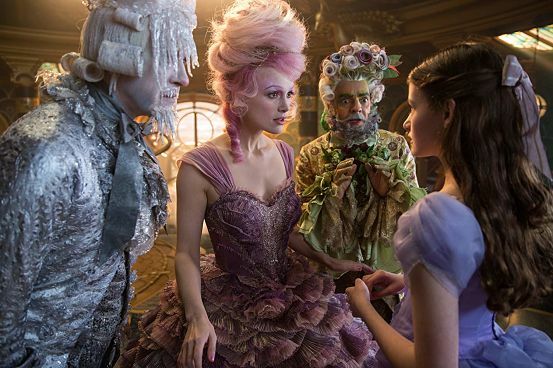 CURIOUSER & CURIOUSER: Clara meets the three regents, who see her as the one sent to save their kingdom. TIM Burton will probably grin like a Cheshire cat when he sees The Nutcracker and the Four Realms. With its visually stunning art direction, crisp 3D visuals and no shortage of whimsy, it’s like a companion piece to his beloved epic Alice in Wonderland. What’s more, it immerses viewers into a fantastical world populated by intriguing creatures and characters facing the eternal clash between good and evil. And a brave young heroine on whose slender shoulders the fate and the future of all rests. Mackenzie Foy plays Clara, a very poised and intelligent young lady, who is part of a close-knit family (a single dad, older sister and younger brother) and is close to her godfather, a wise old gadgetier with an eye-patch, played by Morgan Freeman. But she terribly misses her late mother, Marie (Anna Madley). When she receives an exquisite egg-like object left as a Christmas present from Mom, little does Clara know that the search for its missing key will take her on the adventure of a lifetime. The quest takes her into a mysterious Christmas Tree forest, which leads to a series of magical realms (Flowers, Snowflakes, Sweets), where she is befriended by the regents, Sugar Plum (Keira Knightley), Hawthorne (Eugenio Derbez) and Shiver (Richard E. Grant), who are at their wits end because of the evil Mother Ginger (Helen Mirren), who governs the fourth (Dark) realm with an iron fist with the help of her merry henchmen. Is Clara their long-awaited saviour? With a nutcracker soldier (Jayden Knight) by her side, the young girl musters the courage to lead their newly gathered forces into battle to vanquish the evil once and for all.